Let me untroduce myself, I am Elodie Cartiéri, born on 21st March 1986 in Yaoundé (in Cameroon). I am a nurse in Limoges University Hospital since 2008, and I am quite aware of the humanitarian problems of the planet. Born in Cameroon, and having lived in the United States and finally in France ... I am just 30 years old, and a head full of dreams! My goal, through this association is to make every effort to help Indian children have access to education. During a trip in India in february 2003, I met a trusty local, Jasveer Singh, whose personal involvement gave me the opportunity to set up this project (with the help of my parents who have been in love with India for 25 years). So as soon as we came back, we created this NGO whose goal is to improve the living and working conditions of the children of the village of Katholi in the Rajasthan in India. The motivations are here, and I never wonder " why ? " helping others, but rather " How ? ". From that, it is not so difficult to reach objectives. The Indian state educative system is very weak (although school is officially compulsory until 14 years old) and sometimes it does not exist at all in some villages situated in the country where it is true that the children are often obliged to work in the fields. 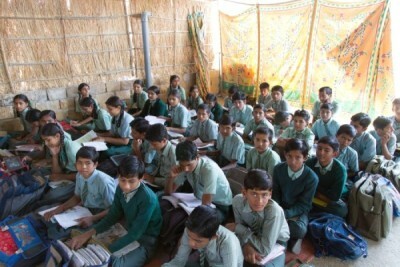 But Jasveer Singh and my self are convinced that their current survival and future successes depend of their education. Several private schools exist in India, but they are very expensive, reserved for the elite, and situated in the urban zones. 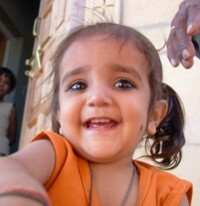 The objectives of the association are defined in Clause 2 of the statutes: " education and durable development within communities discriminated in India (States of Rajasthan and Himashal Pradesh)"
For 15 € per month, you allow a child to learn how to read, write, count in Hindi and in English, for a better future. The education of a child , it is to insure him or her a better future. To teach reading and writing in order to form an adult allows him or her to escape the infernal circle of poverty. Healthy: Health education makes possible for families to understand and manage their hygiene of life. A dispensary in a rural community allows a medical follow-up of the families, and an access to first aid. 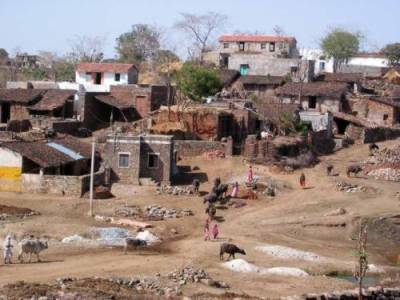 Sustained development: Sustained development The implementation of these complementary objectives, carried out in an interactive way , will induce the birth of a sustained development in the centre of rural, ethnic and tribal Indian communities . We got back there to contribute some hard work to the project and also to improve our network of relationships. Our experience on site is really rewarding, and we are fully satisfied with what has been accomplished. Your support is invaluable : you can make many things easier. 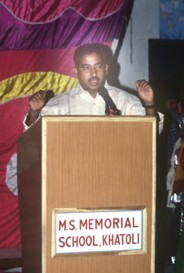 Jasveer Singh our 1st partner to Katholi, has created the school in his village in 2001, in memory of his dead father. When the school opened in 2001, it counted 2 outside classes of 15 pupils each. The rented premises were very precarious (neither drinking water nor electricity). The association intervened from the start of the new term in 2003, and aftrewards I was able to verify the headway of the works repeatedly (in August 2003, March 2004, on summer 2004 and 2005). Ramsawroop Parjarat, the headmaster and English teacher in the school of Katholi, is a very devoted man .Besides having a grant, he gains moral support and educational advice for the good progress of the programs. The teachers understand, at the moment, the importance of a pedagogy which respects the rhythm of every child whilst privileging their creativity. 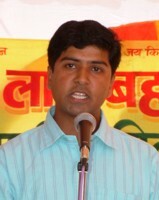 Bharat Vyas, created a school in 2004 in Jaïsalmer, in a very destitute district. He is also the headmaster and the English teacher there. Amardeep Singh, manager of a hotel in Udaipur, and his family, created an Indian NGO to help the inhabitants of tribal village of Jindoli. And, my mother Françoise Cartiéri helps the association to widen its projects even more easily , with notably a permanant control of the actions and projects realized.